Mathematical modeling using dynamical systems and partial differential equations is now playing an increasing role in the understanding of complex multi-scale phenomena. Behavior in seemingly different areas such as sociology, economics, and the life sciences can be described by closely related models. Systems made out of a large enough number of individual members can be said to exhibit a collective behavior, from which insight can be gathered in a way that real-life experiments cannot. Using examples from financial markets and modern warfare to the flocking of birds and the swarming of bacteria, the collected research in this volume demonstrates the common methodological approaches and tools for modeling and simulating collective behavior. 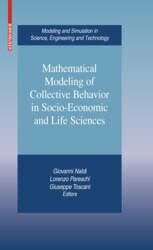 The topics presented point toward new and challenging frontiers of applied mathematics, making the volume a useful reference text for applied mathematicians, physicists, biologists, and economists involved in the modeling of socio-economic systems.